Looking for custom fields created in your CRM to be mapped but the fields are not showing in dropdown? All you have to do is refresh the fields as listed in this article. Note: If following the instructions in this article doesn't work, please try logging out of your Revenue Conduit account and logging back in. If that still doesn't work please email support@revenueconduit.com. Frequently, you may create NEW fields or properties in your Hubspot account that you would like to utilize in one of Revenue Conduit's Admin features. This article explains how to use the Refresh Fields Button feature inside of Revenue Conduit's Admin interface. 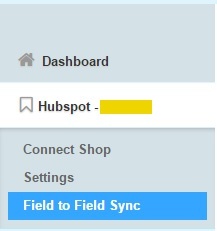 In the Top Right of the screen, click the Refresh Fields Button so that Revenue Conduit requests a list of your most up-to-date Fields/Properties from your Hubspot account.NOTE: You may need to wait a few minutes and refresh the page to see the tag created and associated with the Product or Category you selected. If neither of those work, please Logout of Revenue Conduit and then log back in, again. That's it! Below is picture of the entire interface!